Add the cozy warmth and comfort you need to your bedding with this Shavel Quilted heated electric blanket. The cuddly blanket features a quilted polyester micro flannel surface, two layers of insulation, a down-alternative fiber fill, lightweight flexible wiring to evenly distribute warmth, and a sherpa reverse for an extra comfortable feel. The blanket is available in a variety of sizes and colors, and features two easy to use controllers with eight secure heat settings and a safe, 10-hour shut off. Dimensions 13.0 In. X 13.0 In. X 12.0 In. I am always cold in the fall & winter and was looking for an Electric Blanket. Purchased this one based on other reviews and I am so happy that I made the purchase. The sherpa side is so soft and I can use it minus the heat in the Spring & Summer. It has a sleep timer, which I love. And, it has the highest temperature that I have seen or experienced on any previous Electric Blanket. I usually set it on "2" and sleep comfortably during the night. All warm & toasty. This is not like the old traditional electric blanket's where you feel the heavy wires. On this one, you can't feel the wires in the blanket at all. You can also wash it, if needed. The price was more than I wanted to spend...However, after using it during the cold winter months, it was all worth it! Best Electric Blanket Ever!!!!!! 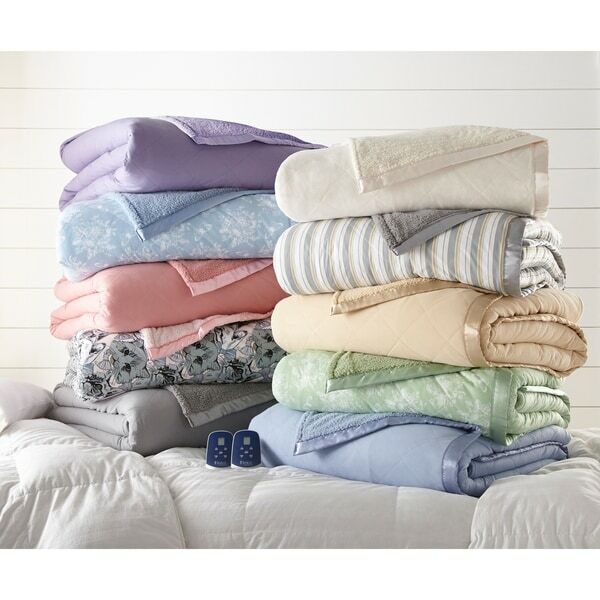 Beautiful quilted micro flannel and sherpa heated electric blanket at a great price. We love this electric blanket, especially the Sherpa softness. It’s the first electric blanket that we’ve owned that actually is a good fit for our king size bed. Ithasabout an 8 inch overhang on the width of the bed rather than just barely covering the mattress top. We have a sleep number bed with a pillow top and most sheets and blankets are not wide enough. It’s perfect. The controls are awesome and easy to use and when we preheat it before going into bed, we actually can feel the warmth. It’s well made, very thick and soft. Cannot feel any wires. Onlything I wish was that the controls stayed lit at night so you could change temp or turn off or on during the night. Recommend to all looking for a high quality electric blanket. I love this blanket. It is very warm without using the heated part. So I only used the heating on it a handful of times when it stopped working. I get an error code. I googled this code and people said it was because one of the pins and gone in. I do not see any of the pins uneven in mine, so I don't know what the solution is. I am very disappointed. This is the third electric blanket I have purchased that only worked for about 2 weeks. I thought buying this one -- which was quite a bit more money than my previous two -- would guarantee me a working electric blanket. No such luck! After purchasing this blanket for our King size bed I bought two additional (queens) for our other two bedrooms. The blanket is really soft and you cannot feel the wires much at all. Although my husband uses the heat feature from time to time I've never used the blanket as an electric blanket since it is extremely warm without using the heating function. So far, this is the very best electric blanket I have ever purchased, and I have purchased quite a few. It is very soft and cozy and heavier than any I have had before. Very warm even when not turned on. I haven't had it that long so do not know how long it will last. But I am very satisfied so far! I would definitely recommend it to a friend. This blanket is actually thick like a regular blanket and has the added bonus of being an electric blanket. It is really plush and thick and you cannot feel the wires at all. it is warm even without the electric component. I am using it as a regular blanket right now and will turn on the electric heat when the weather gets colder.The Wedgewood color is a beautiful blue. I am very happy to have bought this blanket. Update: The control on one side of the queen size blanket stopped working after I had the blanket for six weeks!!! I will be contacting the manufacturer to see what can be done because as of now only one side of the blanket is working. I had loved the blanket but now--not so much! Second Update: I contacted Shavel customer service and they were very responsive. They will be mailing me a replacement control and I am very happy!! The unicorn of electric blankets AND it’s in the perfect shade of light rose! I searched everywhere for a pink electric blanket and this is literally the only one available in a high quality and in this color-a true light/dusty rose. (note: There is one other out there that has polka dots). The blanket is super soft flannel-ish on one side and a yummy thick, soft Sherpa on the other with a lovely thick satin trim. The queen & king have easy to see/use in the dark dual digital controls that heat up quickly. I’ve even machine washed and dried it multiple times per instructions & it just got softer. ***** LOVE it!! I haven't had this very long, but so far does what it's supposed to do. It is very soft and pretty. The chino is actually a very pale soft yellow color. This is the warmest blanket I have ever owned, very warm even without the heat on but not real heavy. It's a nice weight. It's the only blanket I need on my bed. Now the only thing I would really change are the controls. 2 controls is nice, they are pretty big but they have to stay on the floor because the cord is not real long, I am able to set it up how they suggest but the cord for the control is not real long. Also, the auto shut off feature is nice. I usually turn it on high before I get in bed for an hour or so, then turn it down to around 4 or 5 and it's plenty warm sleeping through the night. I would love to see this blanket in a throw size. This blanket is absolutely beautiful but more than that it really keeps you warm. My husband loves this. My absolute, #1 favorite heating blanket of all time! I sleep under one all year round as I’m always cold, and the quality and durability of this blanket are unparalleled. I’ve gone through half a dozen ‘store’ blankets, and this is the only heating blanket I’ll ever buy again! Highly recommend! Ive had many electric blankets but this one is the best, i love this blanket, even if you dont turn it on its so warm, made well i would highly recommend this one. Got it as a lthank you gift for my daughter, she loves it, so does her boyfriend, always asking to borrow it on cold nights, after saying ooh no he would never be under a heated blanket, you can definitely feel the wires, yuck. Told him this blanket shouldn’t be like that at all or I’d find one that wasn’t, but he still said a serious NO thank you. Ooh he regrets that! Now he has to ask her to have a turn under it, lol, always saying it’s nicer than he thought it could be, cozy warm. and soft! I think he has to do her a favor to get it now, lol. So any skeptics out there, just get a bigger size now or your loved ones will be saying hey wait this is really nice! Let me have it for awhile! And you’ll be cold. Or maybe you’ll get lots of favors too! haha Either way you cannot go wrong with this heated blanket!! I like the fact that this blanket is thick enough that I don't need to plug it in to be warm. We actually use this blanket year round. I think I'll purchase another one for the other bedroom. I’ve owned a lot of electric blankets and this has been my favorite. The sherpa is super soft, the cord is extra long and the controls are easy to use. Love my Sherpa heated blanket very soft and warm when I need it. Overstock sent the wrong color and charged me for return shipping for something that was their error. Despicable. Finally a blanket that makes me warm and cozy. This product has dual controls and this is perfect for us. works great. using one or two sides is a great option. would recommend. "what is the wattage on the twin size blanket?" "Anyone know the overall weight of the king sized blanket? Some have commented that it is heavy. Thanks"
I don't feel it is heavy. The wires seem to be lightweight as you aren't aware of them at all. I've had numerous electric blankets over the years and this is my favorite. The control is a bit unwieldy, but you only use it once a day, so not an issue. I absolutely love the very soft and cozy Sherpa fleece. Mine is a king and I have no complaints. Never used it. It's stored away. It is not heavy. Very comfortable. "Is the power remote or wireless?" Plugged in & has cord(s) that plugs into blanket. Never heard of a wireless heated/electric blanket. "I love this blanket very warm, dose anyone know if you can sleep on top of this blanket." I dont know why you would not be able to sleep on an electric heated blanket other than 3 reasons: fire hazard/durability, comfort, health reasons/intended use I cannot guarantee sleeping on top of thw blanket would not break the heatung wires inside it or pose a fire hazard or risk of electrocution. If you have a health problem and should not use a heating oad or blanket IE diabetes, neuropathy etc, don't lay under the blanket or on it. it is intended to be used as a blanket. BUT: I lay on my blanket and actually like laying on it rather than under it. you barely feel the wires inside it. it is plush and soft. it's 6 layers and it is lofty and high quality. the heat spreads evenly thriugh thebwires and blanket, even when I lay on it. it's cozy and feels almost like a heating pad fir aches and pains. You might consider purchasing a heated mattress pad if you want the heat under you. My husband and I have one on our queen size bed and we love it. It makes the bed toasty warm as you climb in it - I love that part. If you get too hot, you can reach over and turn it off. I prefer having the heat under me, but am looking for an electric blanket to use in our guest room at our lake house for an 18" inflatable mattress. I was afraid the heated mattress pad would be too hot for it. "We have a dog who likes to sleep on the bed. Will that cause a problem?" Not unless your pet chews power cords that lead to plug in blanket. This blanket is soft and flexible. You really don't feel the wires inside. My pets sleep with me and try to curl up in my blanket during the night. It's s blanket battle! I've read all the materials that came with my blanket and saw nothing about setting things on top of blanket or how that might affect its' performance. I'd contact the manufacturer on whether or not your dog sleeping on the blanket would cause any issues -- I wouldn't think so, unless he chews on it, but I'd check just to be on the safe side. "Is the Blakey material cotton flannel or a polyester blend?" The label says "100% polyester"
"I bought this a while back. I do like it. But do the controls stay lit while on. Both my controls once on do not stay lit. Can't see control to change in middle of night. " No The controls do not stay lit. That is my only complaint. No, they do not stay lit. Just press one of the buttons, and it will light up again. We usually turn it off when we get into bed or set the timer to shut it off in 15 minutes or so.